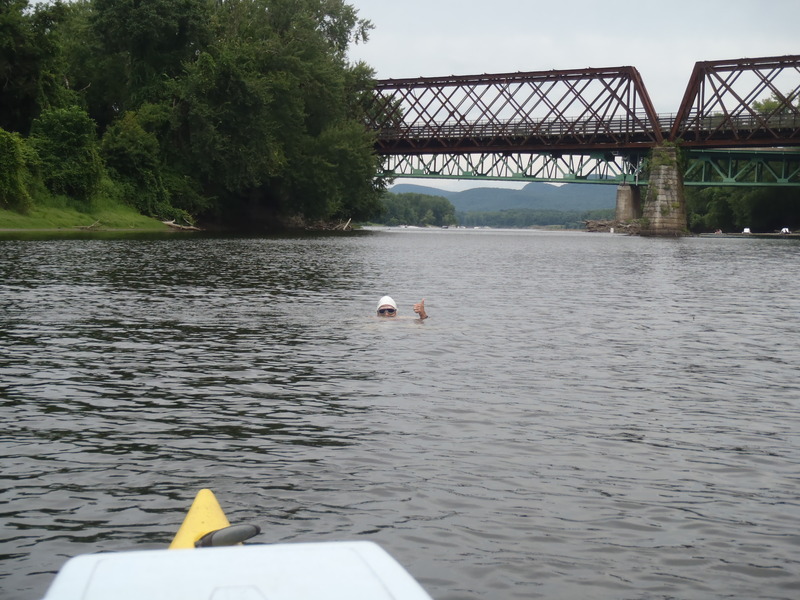 This entry was posted on July 31, 2012, in Uncategorized and tagged Connecticut River Greenway State Park, Connecticut River open water swimming, Goggle Face!, Swimming the Connecticut River. Bookmark the permalink. When you are a lover of open water swimming, every body of water looks slightly different to you than it does to normal folks. 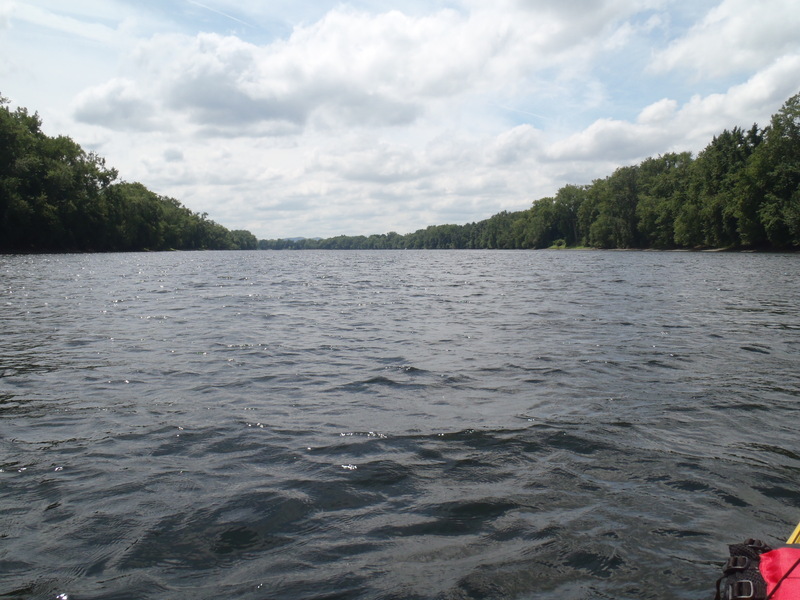 And for me, the Connecticut River has always looked like possibility, water waiting for me. I was raised near the beach, and my one lament about living in rural Massachusetts has always been the lack of beach and “real” open water here. After several years of feeling like I needed to get over myself, I decided that the best way for me to feel less landlocked was to embrace the water we DO have here. And the Connecticut River is it. 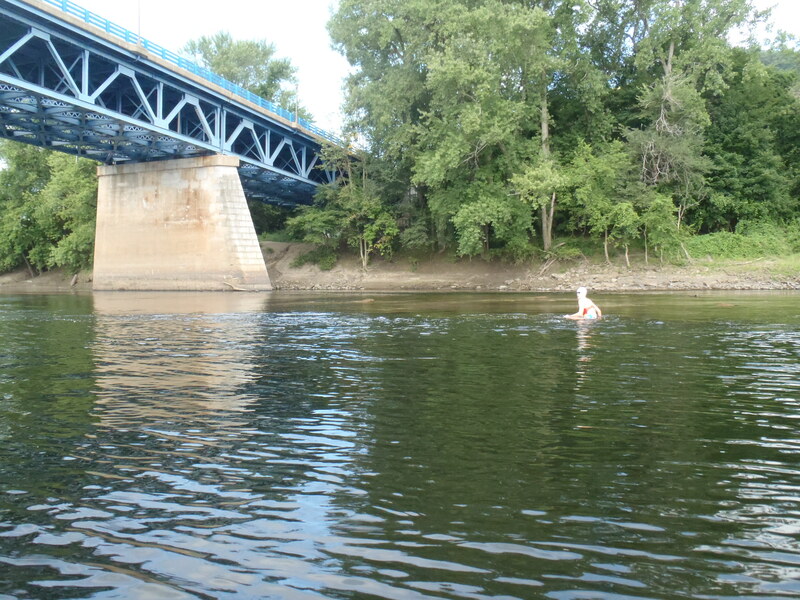 Stretching from New Hampshire and Vermont down to Connecticut, the river is a part of our daily life in the Pioneer Valley, and yet few of us actually get IN it. 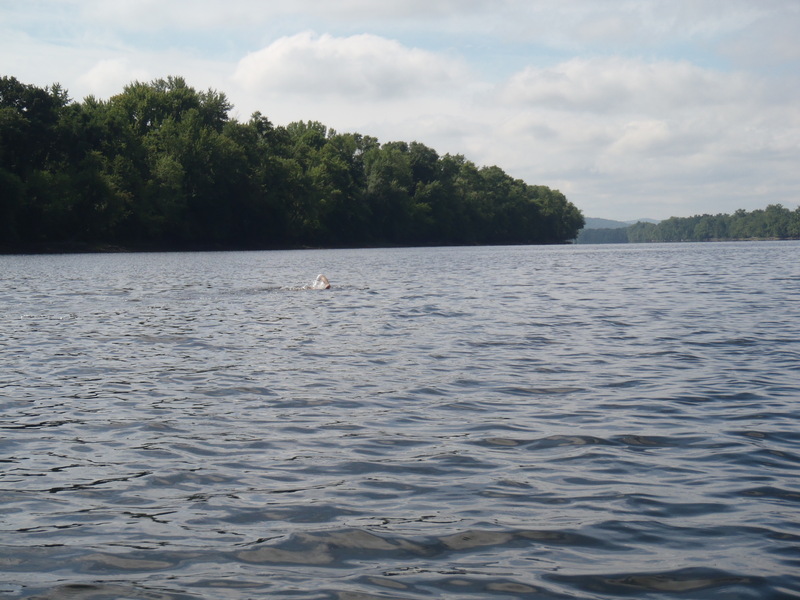 The swim was planned for the summer of 2011 when a little hurricane got in my way leaving the water impassable for quite some time. As a Mom, this week was my week. My son’s last week in camp for the summer and the last week where we’d have a stretch of time without having to arrange for childcare. Such is the life of the mom athlete! Early in the morning, I raced him to camp and met my husband at the Northampton Calvin Coolidge Bridge where I would exit the water. 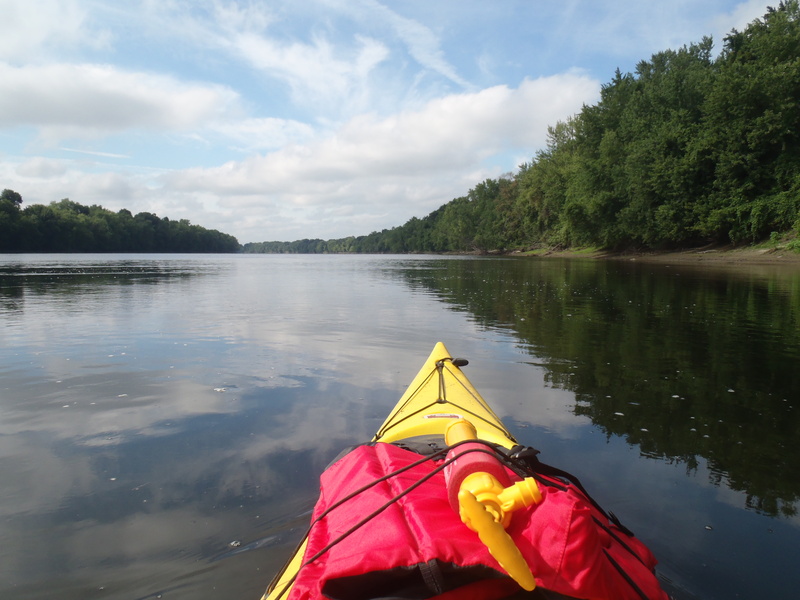 In my part of Massachusetts, we are lucky enough to have the Connecticut River Greenway State Park along the river, including a part that is shallow enough to be impassable by motorized boats but still accessible by canoes, kayaks, and swimmers. This meant my swim would be safer than some I have done in other bodies of water. 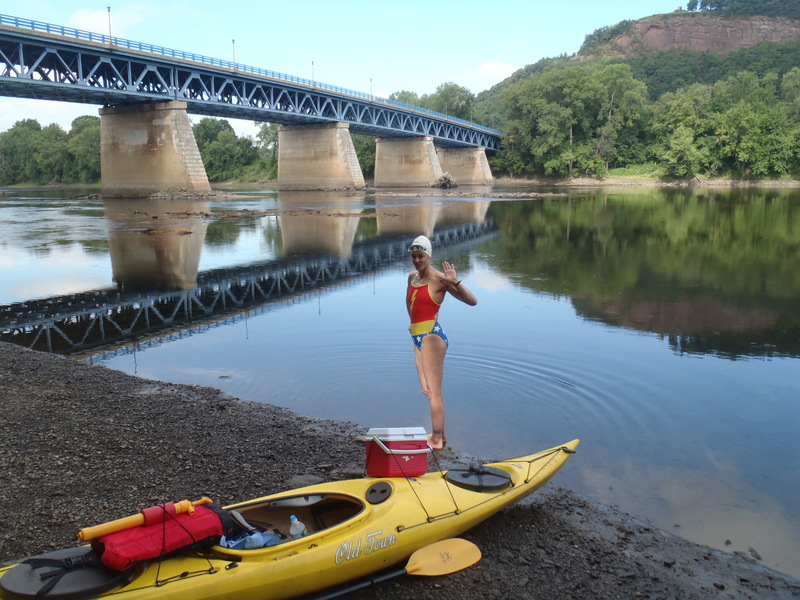 My wonderful husband, John, would act as my kayak support team, providing gatorade and gummy bears on a timed schedule. Yes, there are all kinds of fancy nutritional options out there, and I’ve tried quite a few. So far, I’ve found that simple sugars seem to work well for me. Maybe it’s because I don’t eat sugar otherwise and my body reacts to the sugar infusion quickly. 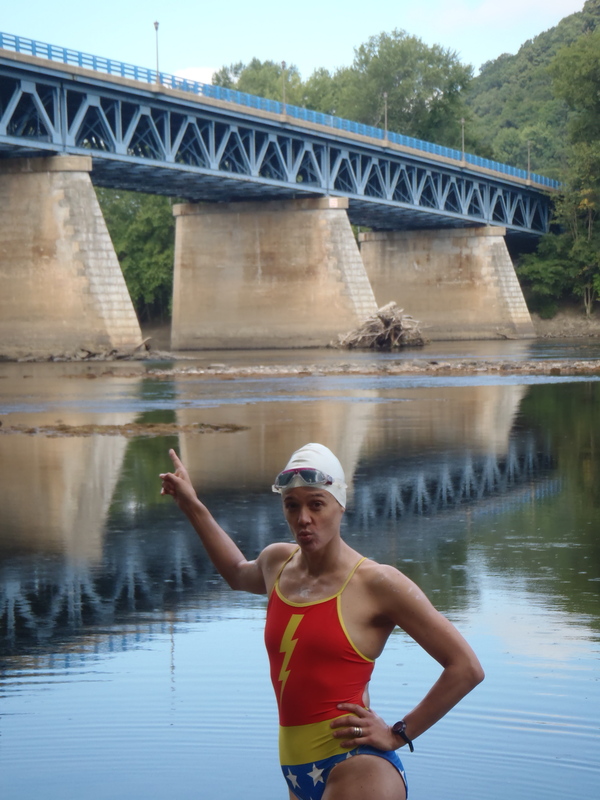 When I try a longer swim, I will need to upgrade my nutrition but for now, this worked well. 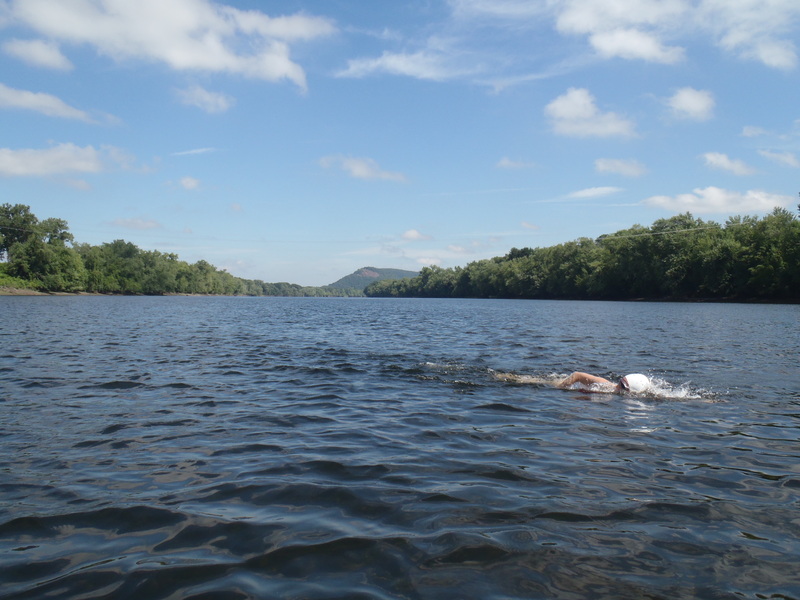 While I had carefully mapped out my route, every open water swim is different, and always unpredictable. For example, who knew that I’d have to walk across the river to get to water deep enough to swim! 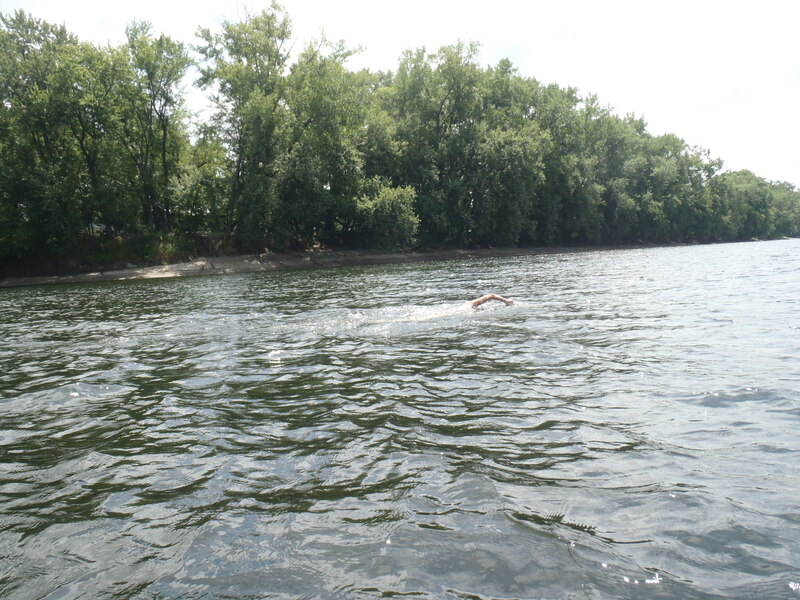 The water was filled with long grass and rocks until I reach the channel where I could swim properly. Thankfully, the water was warm, mid to high 70s, and I knew immediately that I would not risk getting too cold. I had expected a downstream current and yes, there was one, but not nearly as strong as I had anticipated, and more changeable than I had understood it could be. Often, the water felt as if it were working on a cross-current. The first few miles, in some ways, are always the most difficult for me. There’s something about getting into your rhythm and knowing that you have so much left to swim. It’s about getting into the perfect mental space to be in the water for hours and hours and hours and not drive yourself completely nuts! The water was lovely. Cleaner than I had imagined, I could see to the bottom easily. This meant I could see the eels – and man, were those some HUGE eels. 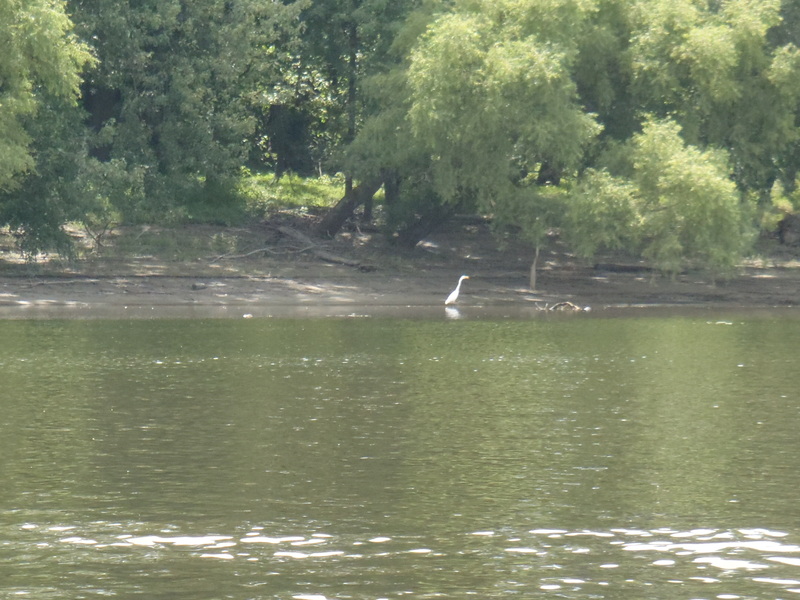 All facing upstream, they scurried away when they saw me. But I certainly got to see them. Some had to be at least 4 feet long, and extremely, well, let’s say full-figured. Perhaps the best omen? 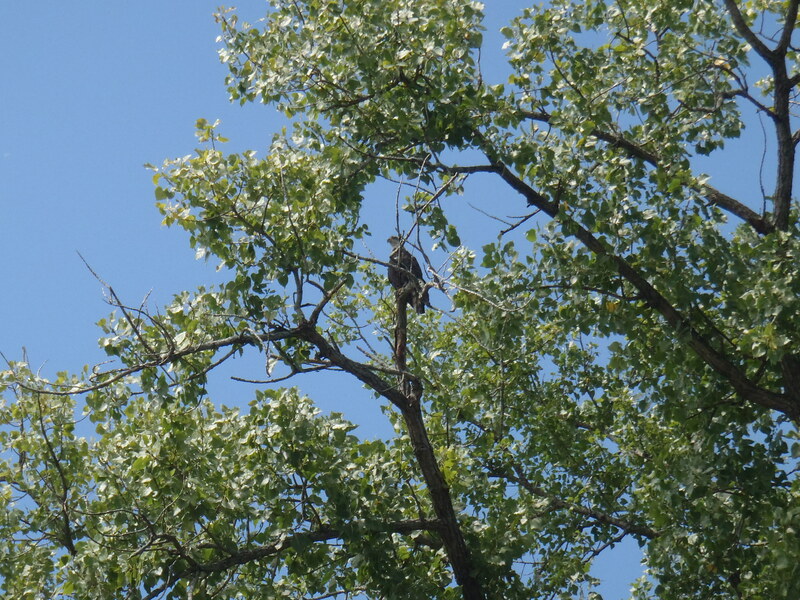 A stunning bald eagle sitting in a riverside tree. There were fish – big ones – and almost no trash. And more eels. And then, there was wind. 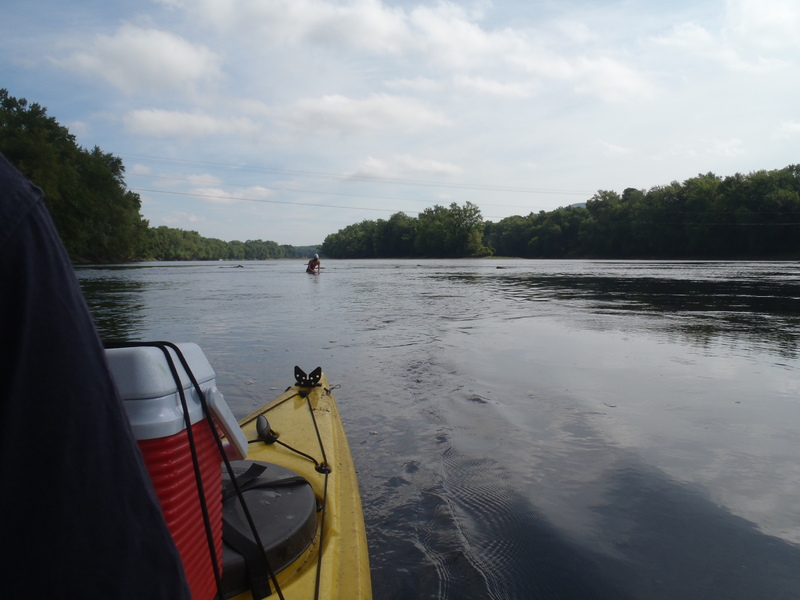 Instead of the helping current I had expected, the wind was now pushing me backwards, enough that John had to paddle strongly to continue moving forward. I kept swimming. And swimming. And swimming. There is a point in every swim where you regret it. You start thinking that this was a terrible idea, that you never should have done it, and that this NEEDS TO BE OVER NOW. For me, that was around 9 1/2 milesas the chop got worse and worse. Why did I want to do this stupid thing anyway? And why had I told people I was doing it? That meant I really couldn’t quit. And besides, how would I get back if I did? I couldn’t hang on to the back of John’s kayak, could I? 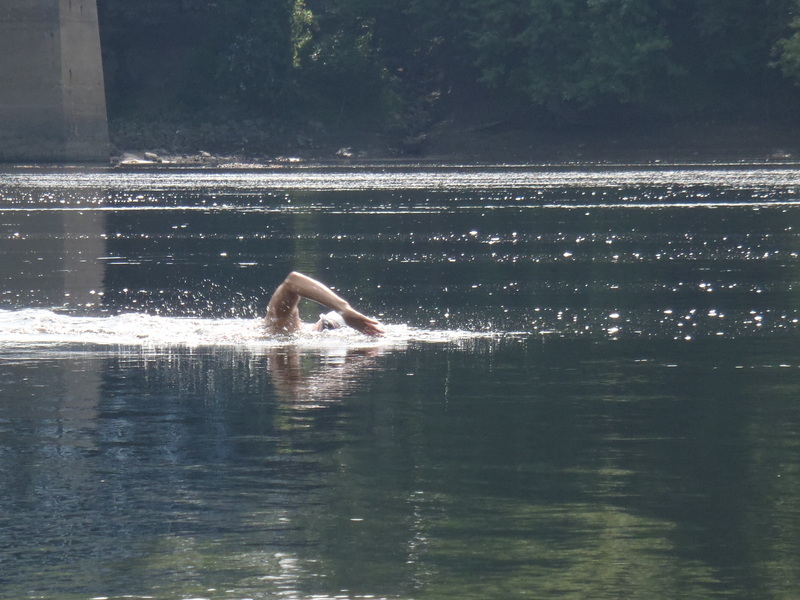 But of course, instead of quitting, I kept swimming. And swimming. And swimming. Mile 10. Mile 11. Gummy bears. Gatorade. More swimming. The bridge was never going to become visible. 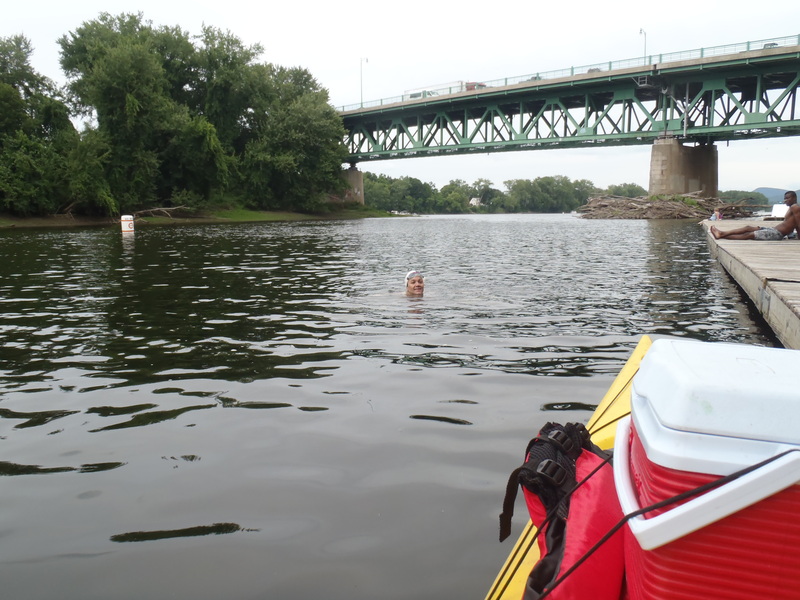 At the end of the swim, there are several islands I needed to go around in order to view the bridge. And those were extremely unhelpful. Seeing the end gives me power, lets me know I am getting close, and that I really can do this crazy thing. Alone, in the water, not racing by simply doing this for myself and to see if I could, every bit of psychological help is critical. More than a year after thinking about it, after 6 hours and 4 minutes and 48 seconds, it was all done. Yes, some folks on the dock wondered what was going on, and who knows what the man we asked to talk our photo thought. And then, like any good parents, into the car and just in time to pick our son up at camp. All in a good day’s work! My goal now? 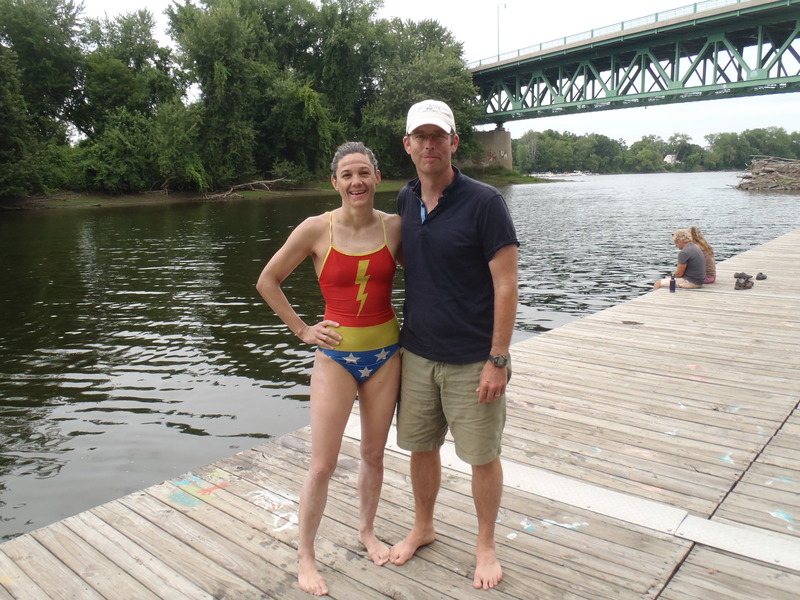 Arranging this same swim as an organized event for swimmers next year – which means you can put this on your race calendar now! Oh, and one more thing? 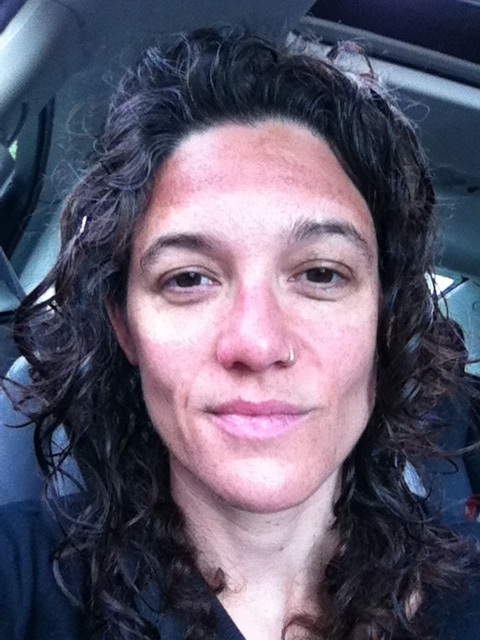 Swim for 6 hours and the goggle face is EPIC. « July 31st is a BIG swim day for me!